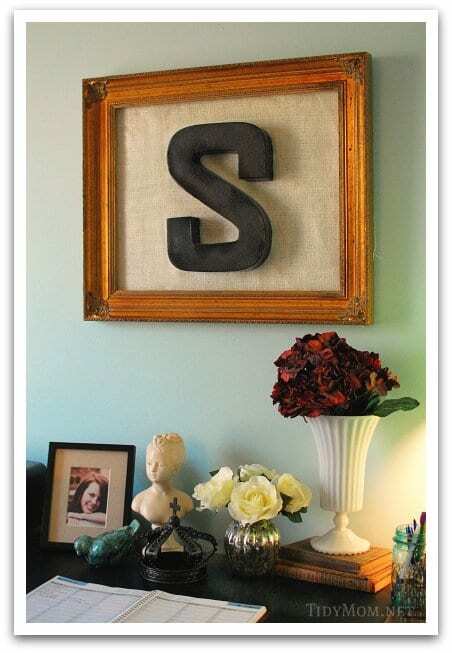 Cheap wall art, with an old frame, burlap and a paper mache letter and a little paint. I’m still working on the walls in my office. I wasn’t sure what I wanted to do with them, until the other day. I spray painted my letter “S” black. Found this great wood frame at the resale shop for $8. hung the frame on the wall over my husband’s desk. and hung the letter “S” in the middle! but for now I like it hanging here! I think I even like the frame left gold……..but I may swipe a little white over it some time. What do you think? Gold? or White? I’d love for you to become a fan! Share recipes, projects and more!! 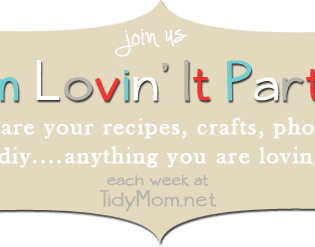 Become a TidyMom Fan here! I Heart Faces – Jump for Joy! New Link Up Party! I’m Lovin It! This is so cute! It looks like it came out of a fancy magazine. Thanks for sharing. I like the frame black. It picks up on the black of the letter. White would be too much of a contrast. Okay, so that's the best idea EVER!! I always have my eye on those gigantor letters and never know how to "dress them up". LOVE IT!!!! Looks great! Love it, what a great job! I always have great ideas I'm just bad with the follow through lol. I looks great! I love the contrast of the gold frame with the black letter and burlap! I love this… anything with typography and monograms is right up my alley and this is the perfect combo of easy and gorgeous! We have a friday fun find party (that's still going)- if you're interested, we'd love it if you'd link up! I'm so glad you came over and linked up to Make it Yours day! I'm definitely on the lookout for a good looking "S" so I can make one for myself! Wahoo! I found you when I was stumbling!!! YOu bet I gave it a thumbs up! Very, very cute! I have just the frame for this same project in my garage right now…..Thanks for the inspiration! !